Thank you for taking this time to look into Lube City ® and our products and services. Whether your fleet has five vehicles or five hundred, Lube City ® can help meet your maintenance requirements, reduce major repair costs and help minimize unnecessary downtime. At present, Lube City ® is supplying services and products to over 1000 companies throughout Alberta. We offer a Care Program for your company fleet vehicles based on manufacturers recommendations and our Best Value Package 31 Point Full Service Oil & Filter Change. There is no appointment necessary and we get you in and out in an average of 15 minutes. 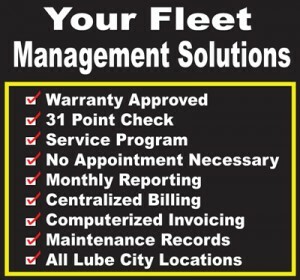 Along with this service we can also supply centralized billing, computerized invoicing to help you manage your maintenance and record keeping, track warranties and service histories for every vehicle in your fleet, and establish care and dollar limits to assist you in maintaining your budget. If you have any questions or require further information, please contact us, we’ll be happy to help. Lube City ® Express Oil Change offers several convenient ways for you to pay for service, track expenses and maintain efficiency. If you have a national leasing program in place, it can be a highly efficient way to track your expenses and let your drivers quickly maintain their vehicles at any of our stores. Lube City ® Express Oil Change service centers accept the following national leasing accounts. Your existing company credit card is welcome at Lube City ® Express Oil Change. It’s already a valuable tool for tracking business expenses, so why not use it to manage fleet maintenance? You can stay in control of expenses with your customized maintenance plan option and offer your drivers service with no fuss. Lube City ® Express Oil Change service centers accept the following major credit cards. Offer your drivers the flexibility of paying any way they want – cash or credit – then receiving reimbursement from you. By setting up authorized services in advance, you help your drivers understand which services are authorized – and which ones aren’t. The result is a smooth-running reimbursement program….where you only pay out for authorized services, and drivers always know what they should pay for.